Hamm has a controversial gold, and an almost-gold. Paul Hamm's bizarre fortnight -- disputed gold in the all-around and a silver on high bar after a tie for first -- added a new chapter Friday. Though FIG wants him to give up his gold, the IOC on Friday announced it would not issue a dual gold for the all-around title, despite a scoring gaffe. Carly second | Carly's all-around | Vault medal for U.S. The Russian Olympic delegation joined the growing list of Olympic malcontents Tuesday, arguing that its two biggest stars got cheated in the gymnastics competition. Paul Hamm says that if the International Gymnastics Federation is going to review tape they have to look at everything. Mike McCool stuffed away his emotions as his baby, Courtney, watched her teammates live out her Olympic dream. Despite earning a silver instead of gold, Bela Karolyi said it's proof the U.S. gymnastics program works. Carly Patterson will carry around the comparisons to Mary Lou Retton from Greece all the way back to America. Hardly anyone noticed, but Elizabeth Tweddle's gutty effort exemplifies what these Games are about. Paul Hamm was done. Then a couple of near-perfect performances gave him a historic gold medal. Paul and Morgan Hamm hope to take men's gymnastics back to the medal podium. 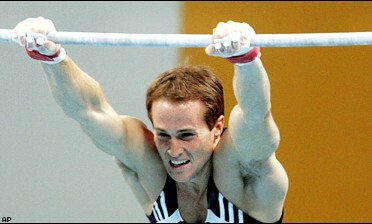 A gymnast who was expected to contend for a medal at the Athens Olympics broke his neck during practice. Coaches have led Mary Lou Retton and Nadia Comaneci to gold. Olympic hopeful gymnast Tabitha Yim ruptured her right Achilles tendon during training Tuesday, ending her chances of making the Athens Games. Twins Paul and Morgan Hamm may have to shoulder the load for the U.S. men's gymnastics team.